Max & Shred is an American 30 minute scripted children television series, which kicked off on October 6, 2014, on Nicktoons and is broadcast every Monday at 18:00. The show is currently in its 2nd season. Nicktoons is yet to announce the renewal of Max & Shred for Season 3 as well as its cancelation. Sign up to track down the show's status and its release date. 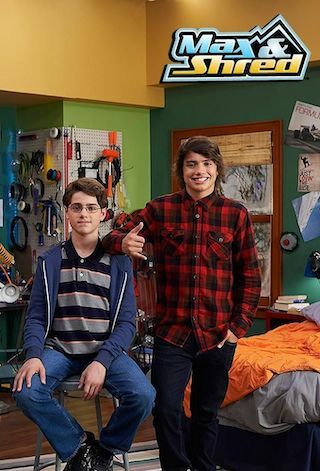 "Max & Shred" is a buddy comedy about the unlikely friendship that forms when easygoing superstar snowboarder, Max Asher, moves in with anxious academic, Alvin Ackerman, and his family. The show centers on the boys' odd couple relationship as they help and hinder each other through the trials of teenage life. Abby, Alvin's driven older sister, and Howie, Alvin's super smart eight-year-old protégé aid the boys in their adventures. Each half hour multi-cam episode will comically highlight the challenges of the young science whiz living with a celebrity athlete in the bustling ski town of Blizzard Springs. It's gonna be siiiick!